1 Russian gymnasts and team officials react to teammate Kseniia Afanaseva's fall while performing on the floor during the Artistic Gymnastics women's team final. 2 Poland's Michal Winiarski after saving a shot against Bulgaria during a men's volleyball preliminary match. 3 Japan's Shiho Otsuka jumps to avoid being hit by Netherlands Sophie Polkamp during their women's field hockey preliminary round match. 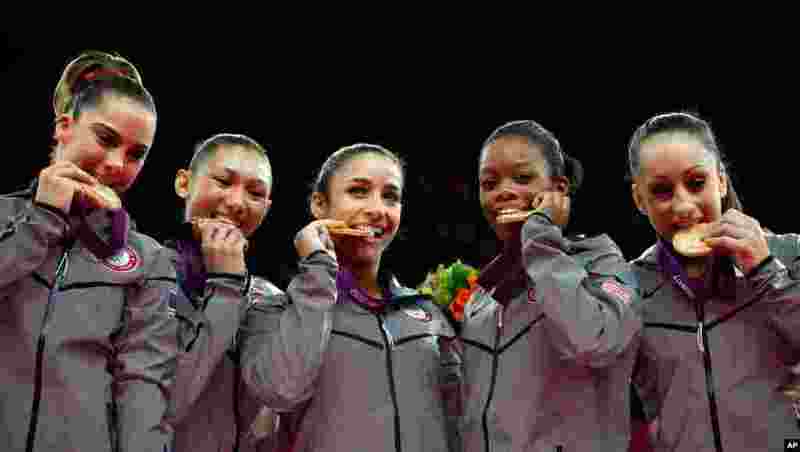 4 U.S. gymnasts McKayla Maroney, Kyla Ross, Alexandra Raisman, Gabrielle Douglas and Jordyn Wieber bite their gold medals at the Artistic Gymnastics women's team final.